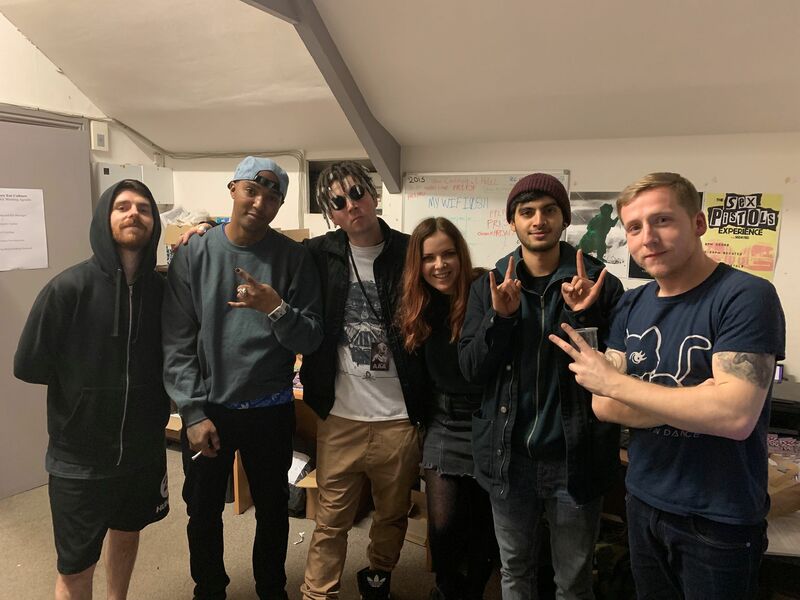 Elizabeth Tomkins interviewed a selection of members of rap-metal group, Hacktivist before their show at Preston's Continental venue. 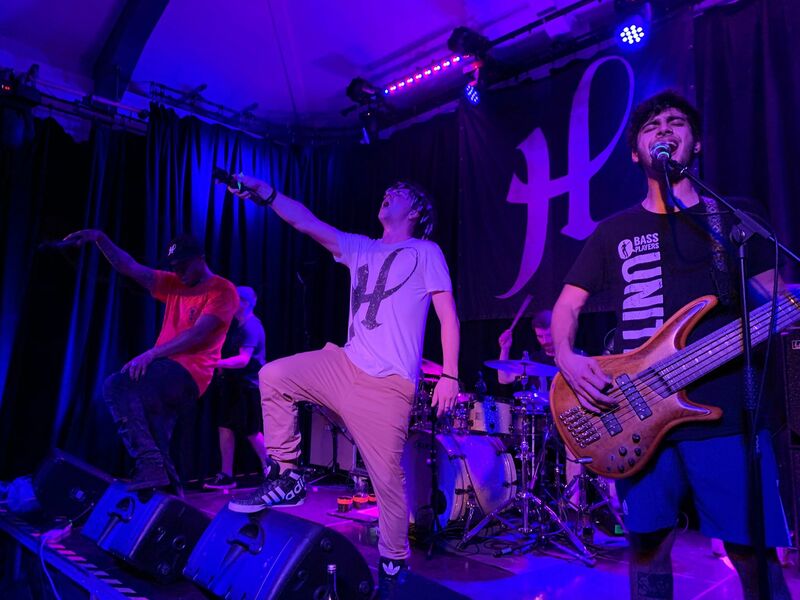 Hacktivist is made up of Jermaine Hurley, Jot Maxi (both vocalists), newly announced guitarist and producer James Hewitt, Josh Gurner (bass) and Rich Hawking (drums). I sat down with Jermaine, Jot and James before their gig in Preston, recently. You guys are back with a tour across the UK, how does it feel to be back performing? Hurley: Yeah it feels pretty good for me! Maxi: Although this is the first block tour we’ve done in a while, performing hasn’t really stopped. The last gig I think was October? We’ve had a couple months’ break for Christmas, last year we were doing shows all-round the place still, but it’s nice to have a big ‘block’. Hewitt: It’s certainly nice for me, I had like 18 months out of live music, so it’s nice to get back in. How did you decide you were the right fit for each other? Hurley: James started it really, he sent a pack of demos and then I knew for myself that it was going to work with him. Maxi: We were being sent things by a handful of potential new guitarists/producers and it got hard towards the end but when it got down to 2 it was just so clear, there was no competition. Then as soon as we got the first 3 or 4 tracks down and we did them so quickly, we really knew we’d found the formula, we’re really happy with it! Hewitt: Maybe not me and you guys, but I’ve been friends with Josh [Bass] and Rich [Drums] for quite a few years, so it fell into place I guess. My writing seems to compliment your bars. In the recent years, losing and gaining members, do you feel like you are moving in a new direction? Hurley: Maybe not a new direction, a better direction. A direction, in the sense that we weren’t really moving before. Maxi: The same direction but with more speed and wind force. I watched the band before, and to me there was massive potential there. I never imagined myself joining until it became a question. But now I just think, wow, the band is going to reach the potential and I get to be a part of it. Hewitt: Versatile would be the word now, there’s some heavier stuff, there’s some lighter stuff, goes in both direction but it stays the band, Hacktivist. Maxi: Yep, there are some extreme vocals and instrumental parts, but we’ve kept the hacktivist ethos of a nice blend of political attacks, mixed with attitude and anger. Elizabeth with the band, backstage. Can you tell me more about the meaning of the new songs? Maxi: The track has a double meaning, because the band have been reprogrammed, and this is the first new single which shows that formula. It’s also about how media and politics is trying to form a certain way of thinking and dumb everyone down, and that’s a theme that’s run through science-fiction and political music for a long time – and we cant let that happen. The chorus says, “my mind is mine to reprogram”, it’s about making sure we educate ourselves and don’t just become victims of what’s being fed to us. The lyrics in your songs have often addressed current social issues is this something you would like to continue to raise awareness of through your music? Hewitt: I think people look to us for it, in our lyrics. Hurley: Yeah, a little bit, we will always be that way – we do have fun as well, it’s not always serious. Our other new track is Anti-MCs. It’s basically about calling out fake MCs that talk about guns, shooting and violence. Maxi: It’s basically about how we are rappers but we hate rappers. The state of rap at the moment, any real rapper would be unhappy with the state of the scene. With these ‘bubblegum rappers’ popping up, with basically nursery rhymes. We don’t always keep it political, we sometimes might attack a rapper or two. Hewitt: We want to call out the fake lines, the fake lives. You’re not a rapper ‘til you’ve dissed another rapper! This tour is in support of Independent Venue Week, what makes you want to support the cause and what do you like about independent venues? Hewitt: You meet a lot of interesting people and venue owners, the first night in Scunthorpe, they were great. You get things in independent venues that you wouldn’t in bigger venues. Maxi: Yeah, you get really looked after and you meet some really lovely people and obviously the gigs are much more intimate. Hewitt: I mean, it goes without saying, any band would be nowhere if it weren’t for these independent venues staying alive and I feel like it’s really important to keep them going. We’ve all got the Crawford Arms in Milton Keynes, home territory – they’re doing some independent week stuff too! I was introduced to you guys when you supported Enter Shikari on tour in 2013, do you think touring as a support has been influential in gaining a following over the years? Hurley: Yeah, definitely, that first tour back in the day with Shikari builds you up, influences you and turns you into an artist. I learnt a lot from Enter Shikari on those tours. I thought it was all about getting smashed every night, I mean it kind of is. But, basically, I learnt how to look after my vocals. Maxi: Touring with Korn as well, was massively influential. Your music has been described as rap metal, nu metal, grime and all sorts! What would you describe your music as and how did your hybrid style come about? Maxi: A fusion of all of those. Rap, djent, metal-core, futuristic fusion really. Hurley: Yeah, punk, djent, grime. It came about from being open to all types of music really, obviously being a rapper and wanting to try new things. Who are a few of your biggest musical influences? Maxi: For me, Korn definitely, supporting them was a dream for me. In rap, the UK grime scene was when I realised I could rap on my own and be taken seriously. So, all of the original grime guys like Wiley, Skepta, JME. Then all the really individual artists like Bjork and Moby, people who make really unique music. Hewitt: It’s tough for me, I grew up on really guitar-oriented music, not metal at all. Stuff like Steve Vai, Joe Satriani. These days, Dance Gavin Dance, Issues – big love for those guys. For the heavier stuff, Meshuggah and Deftones are a massive influence. I take a lot of rhythmic influence from hip-hop and gospel drummers, they tend to come out in my writing a lot. I think Rich [drummer gels with that as well. These guys have got me into grime now, and now you listen to metal – we are all passionate about music and discovering new stuff as well. What songs and artists have you been listening to recently? Hewitt: I’m a total Dance Gavin Dance fan-boy so their album is on repeat 24/7. We’ve had the new Tyler Carter album on in the van, that’s super sick. Hurley: I’ve been listening to a lot of Northlane lately, and I’m feeling Bugzy Malone at the moment. Maxi: I’m been listening to a lot of OmenXIII, Original God, $uicideboy$, this kind of new underground of metal-rap. What’s starting to happen is kids are streaming and doing metal vocals on rap beats, it’s great, it’s all really brand new. There are new uploads every day, I’m really into that at the moment, to be honest. Previous articleHighest Point Festival Returns!